I had only heard about this story briefly. Then, while the details of what happened was being discussed, they showed some video footage of previous interviews with her. I was very impressed by the conviction in her voice as she spoke about her desire to have young girls such as herself receive education and even more so when I considered she would have had good reason to be too scared to speak with such conviction: the very tumultous nature of Pakistan, of where she went to school (in Swat), etc. She was speaking like a woman at least 3 times her age. It was more than just the clear benefit of the very education she was advocating for that you could see in the way she was talking and hear in her voice, but something much more. Something more than just a girl more mature than her 14 years of age. Then, they showed footage of what I believe must have been her first (or one of her first interviews) with her father. She was saying "I want to be a doctor" and was immediately overcome with emotion and couldn't finish her sentence. Her father was sitting next to her and the moment didn't change the look on his face and it was the look on his face that tugged on some strings burried very deep inside of me. It was the look of infinite love and pride for your child. He was smiling with such powerful pride. I imagine her emotions were more than just being camera shy, perhaps the thought of the danger of her speaking out crowded her mind at that time. Then the father says "Relax" and looks into the camera, still beeming with pride. I'm not able to see that video without losing composure myself. This is because I know how that deep love the father was displaying could be so efficiently transformed into the deepest kind of pain and helplessness a person can imagine. I don't believe that the aggregate of all the pain-by-proxy Pakistan, the world at large, and even myself might feel on her behalf would come close to eclipsing the pain he (and her mother) must have felt. The intensity of the love he was showing in that video is exactly the inverse of the pain he must have been feeling as she remained in critical condition, unresponsive, and without anything else to be done but to place his faith in the hands of the medical professionals who were fighting to save her life. And so, when I read in the Guardian this morning that "Malala Yousafzai can make smooth recovery, doctors say," I was overcome - again - with an explosion of emotions, not just for her but for her family as well. Yes, Pakistan needs to heal in so many ways, but that family needs to heal first and this is a great first step in that direction. I deeply hope that she fully recovers and can use the platform she definately will now have to help her achieve the goals of her incredibly brave activism. I may be able to empathize with how her father, when he got word of her attack and when he was on her side, must have felt, but I can't say that I know what her recovery must be feeling like for him. However, at least I have some sense of the magnitude of how that might feel, because I feel some of it now. Man. I'd seen the documentary, but I had no idea she'd been shot. Even though the film made me wonder at her bravery and that of her father, it's still a shock to hear the Taliban carried out their threats on her, but good to hear she is on the mend. 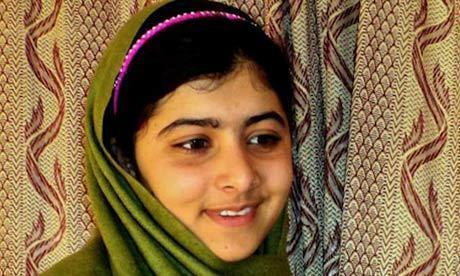 I think that remarkable young lady could have a future that eclipses even Benazir Bhutto's.